If caring for animals is your full time obligation, you know how special your relationship can be with the animal. You are invested in their health and committed to providing them with the best care and equipment to ensure their continued health. An integral piece of equipment in any veterinary office is a veterinary scale. When shopping for a new scale, there are some points to consider and specific things to look for to make sure that you are getting the best quality for your money. – The ideal scale would have heat treated stainless steel load cells in a welded aluminum frame. This combination will provide a light-weight, easy to move and ship, but durable workspace. – Look for what the scale includes. 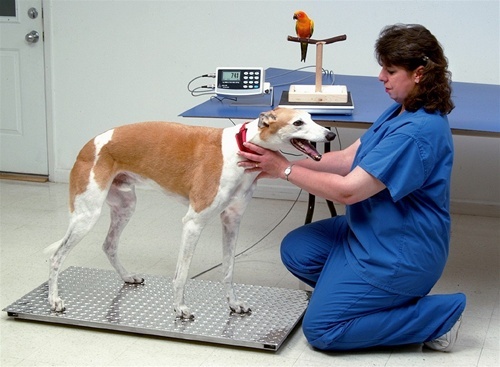 You want a no-slip rubber mat to keep your four legged patients in place while weighing them. An animal is typically frightened enough in a veterinarian’s office and a slippery scale will not do much to assuage those fears. A slick stainless steel surface inevitably needs something atop so that the animals do not move anywhere while undergoing the weighing process. – A digital indicator puts your data collection methods at ease. The 1 inch high block graphics are easily read from far away, or around the back of a larger animal. If an animal is particularly tricky to weigh, many models feature a Weight Average and Hold feature that takes the average of the different weights reflected on the scale. This allows you to gather a more accurate measurement with even the most fidgety of animals. – If youÕre looking to import the collected data into your office database, many new scales come with software to help keep that information on record. It is an efficient transition to make between an office reliant of easily lost carbon copies or lots of paper to a paperless, electronic office with files available at the simple input of a keystroke. – No moving parts. Look for load cells that are embedded within a frame for maximum shock absorption and abuse resistance. This will keep your scale working for you for a long time. – Water (and liquid) resistant. The sensors and display are water resistant, so you won’t have to worry about an anxious animal ruining your electronic scale. – The weight resolutions of scales vary from mere fractions of grams to a number of grams. Consider the type of animals you are regularly weighing and then decide which accuracy is most beneficial. Of course, the more expensive scales have more defined accuracies, but if you are weighing large cattle or bigger dogs, you may not mind minute weight variations. – As always when investing in the purchase of an essential piece of equipment for your business, look for extended warranties and guarantees. This way, your product is ensured from the start and if you have any problems, the manufacturer can resolve these issues without hindering your business. Veterinary scales vary widely in price, aesthetic and functionality. Investing in a good scale with save you lots of money down the road in broken scales and unreadable weights and bad data entry for your business.